This entry was posted in Uncategorized and tagged Anglican, Bible, Disciple, Christianity, Church Fathers, discipleship, Dominican Order, Episcopalian, Jesus, Love, Moral Theology, Religion, Spirituality, St. Ignatius of Antioch, Theology. Bookmark the permalink. 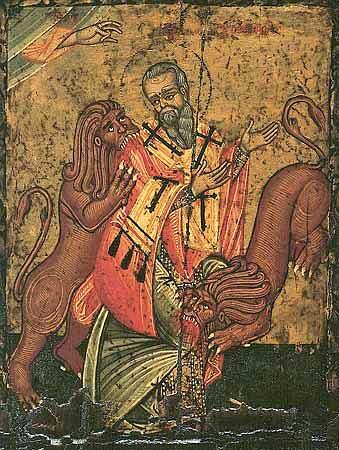 Peanut Gallery: Ignatius of Antioch – Timely post as Syria implodes and Christians find themselves in great danger. It is timely, ABC, and we need that sense of unity, of integration, as much now as we ever have. You are ever so welcome, my friend. Dear Brother, why do we have to be so human? I would wish that somehow we could wipe the slate clean, look back to the beginnings and try it again… God trusted his church to a human so I pray that we can learn how to be in Unity. We have to be so human because we were made thus. Now, what type of human, we get to work that out with fear and trembling. If it is true that “God does not dwell where there are divisions and bad feeling” then I am afraid he would be absent from this fair country every four years during our election cycles. What ever happened to disagreeing without being disagreeable. Anyway, another great sermonette. We do seem to delight in tearing each other apart every four years, don’t we? I suppose it gives us a great opportunity, when all the shouting is done, to work for reconciliation and healing. One of my favorite scriptures: “Thus he prayed, ‘I ask not only on behalf of these, but also on behalf of those who will believe in me through their word, that they may all be one. '” How is it that I have never related ‘that they may all be one’ to the petty disagreements/aggravations i find myself struggling with when it is so very clear to me here? May I begin once again, Father, to try to do your bidding. Amen. I pray that we will both begin again, my friend. A fantastic and encouraging piece of work Bro. James. I am convinced that I am much too often in competition mode. Lord, may we worship You as one body. Blessings good friend. Thank you, Mike. I hope we can begin to see how small our differences are, especially compared with how great a God we all worship. Amen. And thanks for your message of hope and act of charities.